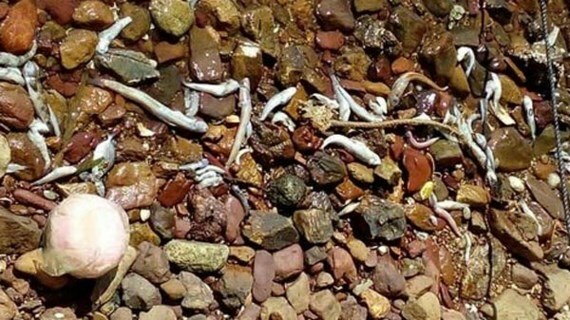 Residents Mekong Delta province of Kien Giang have discovered a large number of fish deaths on water surface along seashores of Kien Luong district and town of Ha Tien since May 7th. Director of the Kien Giang’s Department of Agriculture and Rural Development Mr. Nguyen Van Tam said that the department immediately asked the Kien Giang Office of Fisheries and Aquatic Resource and Fishery Extension Center to visit the location, take samples of water and the dead fish to find out reason after receiving the information from the local residents. In the same time breeders of clams in Ha Tien have found clams dead in their farm, estimated around 60 tons. According to deputy director of sub-Department of Animal Husbandry - Veterinary of Kien Giang Mr. Nguyen Dinh Xuyen, the initial tests showed that water source near Tam Ban sluice in Kien Luong district has sign of pollution, as a result it is spreading to seashore areas.